The Angel Essences are a beautiful set of Essences helping you to connect with the energies and frequencies of the Angels. The Angels will work with you through their essence to help you bring the positive qualities that they embody deeper into your awareness, bringing transformation and higher awareness. Call on them for inspiration, illumination and guidance as you take these beautiful essences. 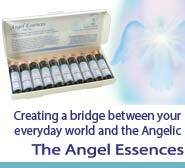 The Angel Essences are a set of twenty essences creating a bridge between your everyday world and that of the Angelic Realms, linking you into their web of light and higher consciousness.